World 6- Tower2 is the second tower level in World 6 in New Super Mario Bros.. This level has conveyor belts that lead to walls that have spikes on them. One third into the level, Mario can get the first Star Coin by simply jumping over spikes. The player should continue moving up, past the Dry Bones and more spikes, until they find two Pipe Cannons. The right pipe will let Mario continue his way to the top. To obtain the second Star Coin, Mario should fall back down to an area filled with Spike Tops. He should then duck onto the conveyor belt and hit the blocks above him, obtaining the coin. Mario should climb a rope to get to the third Star Coin, and then he should go up and enter the double doors to face Bowser Jr. This time, Bowser Jr. will use the turtle shell technique, so Mario can't jump on him without knocking him over with a shell kicked back at him. Star Coin 1 - One third into the level, instead of heading up, Mario should head right while avoiding spikes to collect the Star Coin. Star Coin 2 - Mario should fall back down to an area filled with Spike Tops. He should then duck onto the conveyor belt and hit the blocks above him. 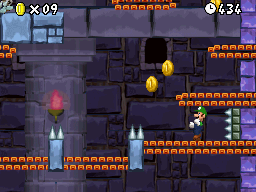 Star Coin 3 - Mario should climb the rope instead of heading into the pipe to collect the third Star Coin. This page was last edited on April 6, 2019, at 01:45.